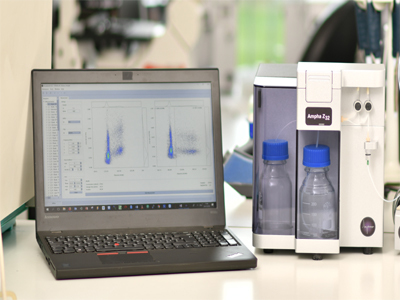 The Patented “Lab On Chip” New-Generation Flow Cytometer Model Ampha Z-32 : An alternative Cell Analysis Technology. Ampha Z-32 provides powerful tool to test pollen viability thereby helping to increase the yield of high quality seed and to reduce the cost of production (for example by increasing the female-to-male ratio and the yield per plant). In addition to pollen, the label-free technology is suitable for analysis of virtually any kind of single cells revealing characteristics such as cell size and morphology, viability (apoptosis), or cell differentiation. The patented, "lab-on-chip" solution eliminates time-consuming, complex sample preparation steps like cell labelling and the need of expensive laboratory infrastructure.